After years of lousy working conditions – including 100-degree-plus interior temperatures – and management refusal to even meet with them on the problems, much less listen, workers at a Walmart-hired warehouse subcontractor in Mira Loma, Calif., were forced to strike starting September 13. 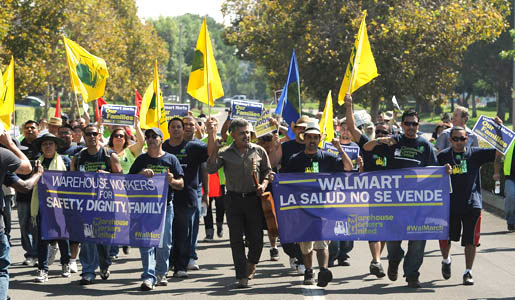 The workers, unorganized in a union but supported by the Service Employees, also called for Walmart to obey its own code of conduct for subcontractors and step in to remedy conditions at the warehouse complex in California's Inland Empire. The world's largest retailer, known for its vicious anti-worker stands, has ignored them. Following the start of the strike, the workers began a 50-mile 6-day march from Mira Loma to downtown Los Angeles. Elected officials and union leaders, including Arturo Rodriguez of the United Farm Workers, marched with them. The struggle between the warehouse workers, most of them Spanish-speaking, and their joint employers, warehouse owner NFI, and a temp labor agency, Warestaff, has been going for at least a year. The workers, calling themselves Warehouse Workers United, say there is little access to clean water, the warehouse temperatures soar past 100 degrees and they have "little access to basic health care, regular breaks, and properly functioning equipment." They also earn as little as $8 an hour, or $12,000 yearly. NFI and Warestaff responded to them with threats, intimidation and retaliation, prompting unfair labor practices complaints to the regional office of the National Labor Relations Board, the group said. The NLRB is investigating. Walmart, as the world's largest retailer, can dictate conditions at its suppliers' warehouses and in logistics operations, but it's refused to act, the group added. "These workers have exhausted all options," Guadalupe Palma, a director of Warehouse Workers United, told a press conference. "Walmart must stop ignoring warehouse workers and intervene to uphold its own stated 'Standards for Suppliers,' eliminate inhumane and illegal working conditions and sit down directly with workers to hear about their experiences and figure out how to improve working conditions." "We want Walmart to sit down with workers to hear about our experiences moving Walmart goods," worker Limber Herrara wrote in an e-mail from Walmart-watch.com, seeking signers on a letter to Walmart to act. "Until now Walmart has ignored us. Because we work for subcontractors, Walmart thinks it can look the other way and pretend it has nothing to do with the illegal working conditions we face. Not any more." That letter will be delivered to Walmart execs at the end of the march. This article was originally published by People's World.